Educational days: cascading information, these can be hosted by companies wishing to raise awareness of a specific product or issue. Flora Pro-active, for instance, wanted to promote their new 'blood pressure' drink and asked Dr Chris Steele of This Morning to talk to WI members at the college about blood pressure. Demonstrations: run through the Home Economic Unit to demonstrate products and hold 'bake-off' competitions. Of course, Denman is not the only venue that we can arrange a demonstration or educational day as our membership spans the entire country so if you would like to target a specific regional area please let us know. For demonstrations or educational days please contact our Advertising Manager, Andrew Lawston, on 020 7371 9300 and dial ext 222 or use the Contact us form and select 'Advertising'. Denman offers peaceful tranquillity in a relaxed country house in beautiful grounds, an ideal setting for any corporate or private event. 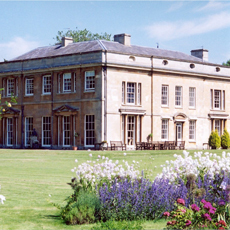 Denman is situated in 17 acres of beautifully landscaped gardens in the heart of the English countryside, eight miles southwest of Oxford and only half an hour from the centre of the Cotswolds. Get directions to Denman. The perfect environment for a wide range of events, Denman offers excellent value for money. The brand-new Ferris Room, opened in 2008, can accommodate conferences or other events up to 150 people and offers state-of-the-art audio-visual facilities. The college has a wide range of adaptable seminar, 'break out' and meeting rooms designed to be used in a variety of layouts. The rooms are well-equipped with video, audio and digital equipment. Denman offers first-class catering and menus can be adapted to suit special dietary requirements. The dining room can seat up to 80, with buffet facilities for more, if required. The gardens also offer the perfect setting for marquees and increase the dining and buffet capacities further. A bar is situated in the library which has immediate access to the terrace with views of the lake and gardens. The college offers excellent bed and breakfast accommodation for any event. The bedrooms are decorated by WI members. Most are en-suite with the remainder having adjacent bathrooms. For conference bookings please contact our Advertising Manager, Andrew Lawston, on 020 7371 9300 and dial ext 222 or use the Contact us form and select 'Advertising'.